Semiconductor-pokers at Mercury Research have crunched the numbers to chart AMD's resurgence against Intel's virtual x86 server CPU monopoly. Aaron Rakers, senior analyst at Wells Fargo, has seen the second 2018 quarter numbers. He told The Register: "Intel's server CPU share is estimated to have declined to 98.7 per cent vs 99 per cent in the prior period and 99.5 per cent a year ago. "AMD's server CPU share increased to 1.3 per cent in 2Q18, up from 1 per cent in the prior period and 0.5 per cent a year ago." 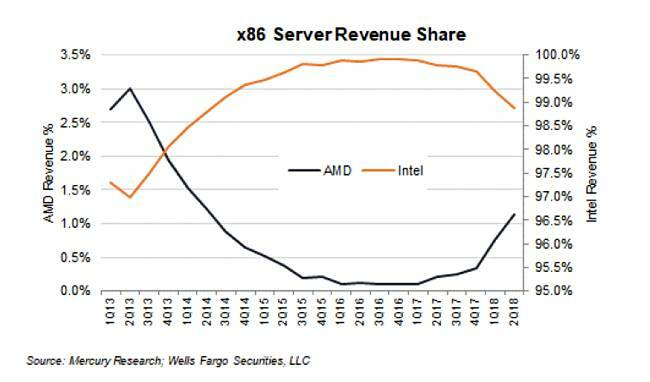 He charted the two sets of numbers to reveal a fish-shaped exchange of server CPU revenue share between Intel and AMD. Figures from Mercury – which tracks the market for microprocessor and graphics PC components – show that AMD's total server units were up 181 per cent year-over-year and 40.5 per cent sequentially. Mercury estimates Epyc revenue was $57.66m in the second 2018 quarter vs $36m in the prior quarter. Rakers said AMD believes it can grow its current server market share position to mid-single digits by the end of calendar 2018. Achieving a 5 per cent share in just two quarters from the current 1.3 per cent level and 0.4 per cent/quarter growth rate looks unachievable. PS: AMD unveiled its 32-core second-generation Threadripper high-end desktop processor on Monday after previously teasing it in June.